We're beginning year-three into the now officially designated Jack Eichel-era for the Buffalo Sabres. We all knew that after the Sabres took Eichel second-overall in the 2015 NHL Draft that this would be his team and it became official when he signed an 8yr./$80 million contract extension on Tuesday. Eichel is now a Buffalo Sabre for the next nine years and he's pretty thrilled with it. "This city means so much to me. I like to think that I mean a lot to the city as well," he told the press yesterday. "This organization has been nothing but great to me since the first day I walked through the doors. They've given me every opportunity that I've wanted. The city the same way. People are good to me, they're good to my friends and family, so I have nothing but great things to say about Buffalo. I think I really owe it to them and I owe it to myself to do something special here with the group of guys we have here in the room and in the organization. It's really exciting times. It's an organization that has believed in me and I owe a lot to it." And with that the Sabres begin anew with Eichel as their clear leader. In diving into this year's preview, we'll take a quick look at last year. Nearly every prognosticator had the Sabres making further progress in their rise from the basement. Former head coach Dan Bylsma set the mark at 95 points which would have been a 14-point increase over the prior season. On the positive side the pundits pointed out that the Sabres had some offensive firepower plus a full season under Bylsma's system while on the negative side it was pointed out that their defense was weak and that they wasn't much depth. There was also a big question-mark in goal as designated No. 1 goalie Robin Lehner had yet to prove that he could stay healthy and/or take the reigns as a full-time starter. Almost nobody, however, thought they'd take a step backwards with a 78-point season and nobody saw the disconnect and discontent that ruled the roost in Buffalo last season. Injuries happen but the rash of injuries, including one to Eichel on the eve of the season which kept him out the first 21 games, pretty much put a nail in their coffin in October. The disaster that unfolded for the remainder of the season eventually lead to the firing of Bylsma and GM Tim Murray. On the positive side, those firings would lead to opportunity for Buffalo as they brought in Jason Botterill, a three-time Cup-winning executive from the Pittsburgh Penguins organization, as GM and a head coach in Phil Housley who was an assistant in Nashville and coached the most dangerous defense in the playoffs last year. Bringing in Botterill represented instant credibility as he was considered one of the best GM's in waiting while the hiring of Housley brought the team up to date with the way the game is played today. With that as a backdrop, we take a look at the team Botterill has put together and the one that Housley has to work with this season. It all starts with Eichel, who's entering his third season with the Sabres. He was impressive in the 61 games he played last year scoring 57 points (24+33) and he's been getting a lot of attention from the national media as he seems poised for a breakout season. But we shouldn't forget Buffalo's other top-center, Ryan O'Reilly. He started out last season struggling with injuries and had a mid-season emergency appendectomy yet still finished second on the team in scoring behind Eichel. Plus he's still doing his after-practice sessions with any teammate willing to stay for some extra work. In all, not much has changed in the forward group but Housley did a little juggling in an effort to try and maximize secondary scoring. Housley moved Sam Reinhart off of Eichel's right wing to center on the third line giving him strength down the middle. The move has also had an impact in a number of other ways. First off, it created an opening at right wing next to Eichel and the Sabres don't seem to have a strong candidate to fill that role. Of the players auditioning through camp, 34 yr. old Jason Pominville, who's back in Buffalo after being a part of a trade with the Minnesota Wild looks as if he'll get first crack. Pominville has the savvy and can still skate but he may end up being a filler until they can find a match in that spot. Having Reinhart as a third-line center also causes some juggling in the bottom-six as Johan Larsson moves from that spot down to the fourth line and with signee Jacob Josefson locked in as the center on that line, Larsson moves to wing. At time over the course of the past two seasons, Larsson has centered a two-way third line that was oft-times the best line for the team and how he adapts to the fourth line, especially on the wing will take some adjustment. And finally, but maybe most importantly, Reinhart has some adjustments to make as well. For the last two seasons he's mostly been a fixture on Eichel's wing and the move to center has been a struggle at times this preseason. Reinhart's a very intelligent player and he should be able to adapt, but it's still a big change for him. Evander Kane is in the final year of his contract and is on Eichel's left wing. Bylsma had used him up and down the left side these past two years and last year Kane scored 28 goals, the most he had since his 2011-12 season with the Atlanta Thrashers. It's not that much of a stretch to think he'll end up in that 25-30 goal range again, but if he and Eichel can mesh, he could hit a career-high in goals before the end of his contract meaning big bucks this off season. Right wing Kyle Okposo will once again be with O'Reilly. Okposo is returning from a scary late-season incident where he had an adverse affect from medication being taken while recovering from a concussion. He was signed to a big free agent contract last off season and was having a decent year before this occurred. One would think it will take him a bit to get up to speed, but the chemistry between him and O'Reilly is unmistakable. Rounding out the top-six, at least to start, is left wing Benoit Pouliot. The former first-rounder is coming off of a dismal season in Edmonton where the Oilers bought him out. This is probably the biggest hole in the Sabres forward group but if Pouliot just follows O'Reilly and Okposo's lead, the 31 yr. old could revive his career while also being a big help to the team. Pouliot's big and he skates well and had been consistently in the mid-upper teens in goal-scoring prior to last season. Opportunity awaits him in this role. Zemgus Girgensons got first crack at landing with O'Reilly and Okposo but looks as if he'll be settling into a bottom-six/defensive role for the team. Girgensons struggled under Bylsma but Housley has shown a lot of faith in him and he looks to be starting the season on Reinhart's left wing. On the other side is Seth Griffith who worked his way into the opening night roster. 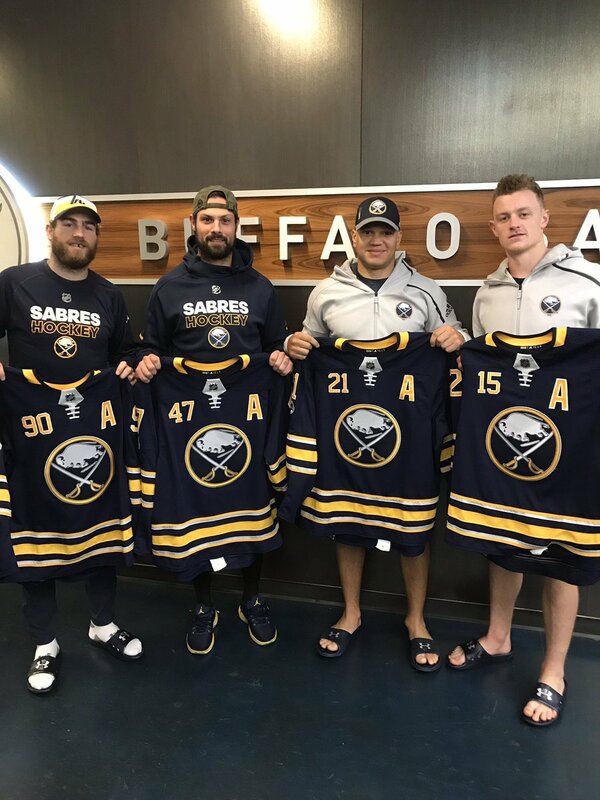 Griffith, who scored in bunches at the AHL-level but has yet to transfer that to the NHL, made waves in the final preseason game and almost ended up on Eichel's wing to start the season. This is a huge opportunity for him. Joining Josefson and Larsson on the fourth line for tonight looks to be recent waiver-claim, Jordan Nolan, the son of former Sabres coach Ted Nolan. Buffalo claimed him off of waivers and comes to the Sabres with two Stanley Cup rings, a big body and an enforcer's edge to his game which is a combination that Housley seems to like. The 33 yr. old Matt Moulson has struggled mightily with the Sabres 5v5the past two seasons but has been deft on the powerplay. With Pominville on the second-unit powerplay Moulson looks like he'll be up in the press box despite his $5 million AAV contract. Unlike the forward group which had movement but very little turnover, relatively speaking, the defense-corps went though a significant overhaul this off season. Botterill brought in three new players and all of them of the puck-moving variety. Rasmus Ristolainen will once again be anchoring the Sabres blueline. The 22 yr. old will be entering his fifth season in Buffalo and the debate rages as to just what the Sabres have in him. He was a workhorse for Bylsma and finished 15th in the league in scoring amongst defensemen but the analytics community see nothing but unfavorable numbers and results. Botterill acquired defenseman Marco Scandella from the Minnesota Wild with the intent to place him alongside Ristolainen on the top-pairing. Scandella had played a top-four role in Minnesota and Botterill thought he had more in him. Off season elective hip surgery has slowed the 27 yr. old Scandella to the point where the team kept him out of preseason games. He's a big, mobile defenseman who moves the puck well and is a key for the Sabres' defense corps. Jake McCabe must have been thrilled with the Housley hire as he captained Team USA to the gold medal at the 2013 World Junior Championships with Housley as his coach. McCabe had been trudging along these past two seasons playing in the top-four mostly in a defensive role. He's had many more good moments than bad, even while playing top-pairing minutes, and he seems to have some untapped offensive potential lurking under the surface. Maybe not a lot, but if Housley can bring some of that out, every little bit helps. Former GM Murray got the ball rolling on free agent KHL defenseman Victor Antipin and Botterill closed the deal. The 24 yr. old with six Russian professional seasons under his belt comes to North America with good skating ability and a keen eye for finding open ice plus the ability to finish. Plus he can man the point on the powerplay and plays the right side despite being a left-handed shot. Another newcomer to the Sabres is Nathan Beaulieu, whom they traded a third round pick for. The former Montreal Canadian had played up and down their defense corps last season even starting out beside Shea Weber on the top-pairing, but was relegated to the bench for The Habs final playoff game last season. There's opportunity in Buffalo for Beaulieu and what he does with it is up to him. We haven't mentioned Zach Bogosian yet simply because he probably won't be in the opening lineup because he's injured...again. The 27 yr. old Bogosian, who has 10 NHL seasons under his belt, hasn't played in over 70 games since the 2010-11 season. Bogosian is a big defenseman who can get up ice and has a cannon of a shot. This year provided the opportunity for start fresh as he really struggled under the former regime. He looked good in preseason, but have to wait until he's healed to figure out just how much of an impact Housley has on his game. Josh Gorges is a trooper, but unfortunately for the 33 yr old, it looks as if he'll be relegated to the press box for much of this season barring an unforeseen rash of injuries. Gorges is in the final year of his contract and the rugged game he plays is getting lost in the speed with which teams now play the game. Justin Falk followed up a surprisingly strong season last year in Buffalo with an equally impressive training camp this year. He's a big, sturdy defensive-defenseman who's been as steady as they come in a bottom-pairing role. Falk, however, suffered an injury and is on IR. What will happen when he comes back will be based upon what's happening with the defense corps but he's earned a spot on the Sabres roster. The beneficiary of the Bogosian/Falk injuries is Matt Tennyson. The NHL/AHL tweener's eventual assignment to the Rochester Americans was put on hold with the injuries and he may even be in tonight's lineup. Whereas last year we were wondering whether or not Lehner could make the grade as a starter, this year we'll be asking the question, can he stop the puck in the shootout? Lehner did pass the test last season by appearing in 59 games for Buffalo going 23-26-8 with a 2.76 GAA and a .920 Sv%. However, he couldn't do anything in the shootout as he faced eight shooters and never stopped a puck. Hopefully he'll be able to shake that with a new head coach. Lehner was signed a one-year, "show-me" deal in the off season and even though he said that he had nothing to prove, there is some "proving' yet to do as he needs to bring that GAA down and he needs to up his game in the shootout. It will help him in his next contract and help the team now. Botterill brought back Chad Johnson to be a backup. Johnson had been with the Sabres in 2015-16, Lehner's first season in Buffalo, and was forced into the starters role when Lehner was felled by a high-ankle sprain in the very first game. He finished the season with a career high in games and wins while finishing with a 2.36 GAA and .920 Sv%. He went off to his hometown of Calgary to seek fame and fortune in a starting role but comes back to Buffalo in a more comfortable position as a backup knowing full well he can answer the bell as a starter if need be. 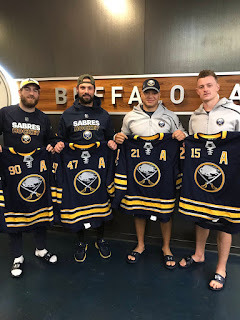 On July 1, 2014 the Sabres brought in three veteran players to help guide the team through the dire straights of transitioning from a bottom-dwelling team to a young team on the rise. All three of them wore letters. Captain Brian Gionta was not offered a contract this off season while assistant captains Gorges and Moulson look to be in the press box for tonight's opener. Buffalo is on their third coach and second GM since that day and while Gorges and Moulson have been continuously with the club, only one player, Girgensons, will have played full seasons in Buffalo the past three years and is in the starting lineup tonight. Only two other players-- Reinhart and Ristolainen, both of whom spent partial seasons on the Sabres in 2014-15--were on the opening night roster three years ago along with the aforementioned. When you consider that Girgensons, who is entering his fifth NHL season is the longest tenured Sabres player to have played for Buffalo the last four seasons, one can see the amount of turnover this team has gone through since the Sabres went all-in on the rebuild. Within that process of change came philosophical changes as well--in personnel by the GM and coaching strategies by their bench bosses. The Sabres went from 54 points in 2014-15, the season before drafting Eichel, to 81 points the following season, which was the first under coach Bylsma. Last season didn't work very well as they finished with 78 points and they're embarking on a new direction this season. In last year's preview the thinking here was that they could build upon the previous season to the point where defensive shortcomings would be offset by increased scoring. Having Eichel and Kane go down early in the season and having discontent resonating through the locker room the latter part of the season didn't help much either. The team has a lot of talent up front and although their top-six is not complete, Eichel, O'Reilly, Okposo and Kane still have more to give in the production department. Housley moved Reinhart to the third line to ramp up secondary scoring, but what will the affect be on primary scoring and can he at least match his 42-plus points this season? Having the defense join the rush will be huge for this club moving forward and should help the forward group. The Sabres were amongst the worst in the league in production from defensemen and whether it was talent or scheme, or more than likely a combination of both, last year was unacceptable on that front. That will change this year as Housley's hallmark is getting his defensemen involved in the offense. All that said the Sabres only scored 12 goals in six preseason games. Sure, it's only preseason, but that may be a harbinger of early season struggles on offense. The key early on might be on preventing goals and that will primarily lie on goaltending. With defensemen joining the rush and the team learning a new system, odd-man rushes coming back will probably be an unsightly side affect of trying to generate more offense. Can Lehner and Johnson come up big at the right time to give this team a chance? Finally, we shouldn't overlook the importance of special teams. One of the reasons Buffalo managed 78 points last season was because they had the league's best powerplay. That powerplay success will need to continue this season and there's no reason to believe it won't, especially with a much better second unit featuring the additions of Pominville and Antipin. With the league cracking down at least somewhat on hooks and slashes, Buffalo will need to be much better on the penalty kill which finished 25th in the league last season. Killing off penalties in crucial situations can really help swing momentum to their side or keep momentum from shifting away from them. If they can manage all of those little things, a point here and a point there will add up as the season goes on. While I agree that the playoffs are a bit of a longshot for the Sabres this season, they should be in the playoff mix well into March and hopefully into April as well. To do that they'll need to be on pace to finish in the 90-95 point range. That's where I had this team last year and that's what I think they have in them for the 2017-18 season.